Oscar Zoroaster Phadrig Isaac Norman Henkel Emmannuel Ambroise Diggs (James Franco), a somewhat insignificant, traveling magician who is not only a womanizer but something of a conman finds himself in what seems to be an alternate universe nothing short of fairies, witches, giant blooming flowers and flying primates. It’s evident from the start this trickster is not so honest, however with a couple instances in the beginning it’s shown that there’s potential for a good heart in Oz, which is his much shorter nickname. With fantastic colors, beautiful scenery, a boisterous soundtrack, and both witty as well as dramatic dialogue, is an entertaining joyride complete with gratifying visual effects and praise-worthy acting. However this film is slightly run-of-the-mill when all the pieces of the puzzle are put together. Whilst he is fleeing from an attack by the boyfriend of one of his seemingly many female confidantes, Oz jumps into a hot air balloon and flies away. Unfortunately for him a monstrous tornado is directly in front of Oz and he gets sucked into the deadly wind spiral. After praying and promising he’ll be a better person Oz lands a world of color rather than the previous black and white and through a couple obstacles turns up in a river of sorts. The first person he meets is Theodora (Mila Kunis) who informs him that she is a witch and that the prophecy of her late father in which a wizard would come from the sky to save the Land of Oz (coincidentally this world has the same name as his) has been fulfilled with his arrival. Being the not-so-moral character Oz is, he does not deny the title as wizard due to the role as king that comes with it and of course the beauty of Theodora. Throughout the rest of the movie Oz meets other witches (Rachel Weisz, Michelle Williams), an affectionate flying monkey named Kinley (Zach Braff), and a female china doll simply named China Girl (Joey King). 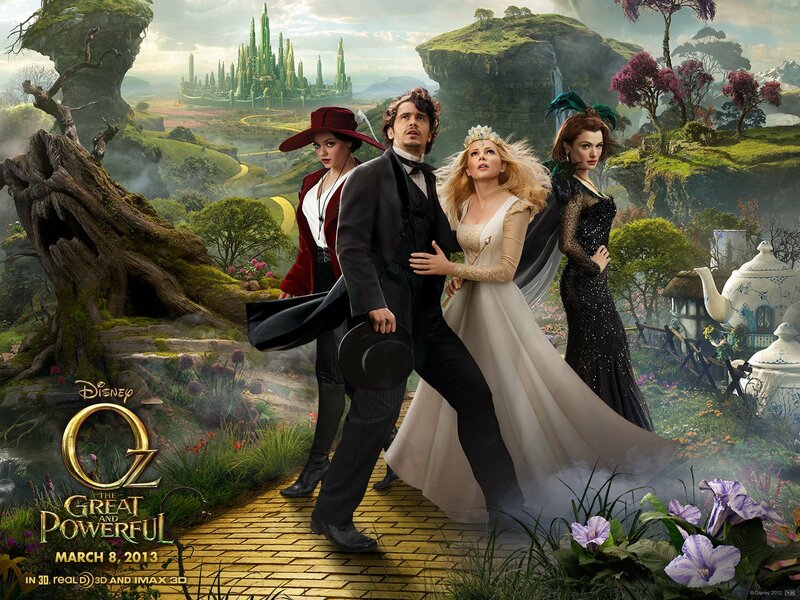 Oz the Great and Powerful brims with emotion, comedy, drama, child-friendly content, thrills, and romance. A running gag shows Oz’s womanizing when he gives a music box to a woman he fancies and tells them it was his grandmother’s along with a whole sob story, making the girl feel special and ultimately leaning in for a kiss. Once in the Land of Oz, he gives one of his infamous music boxes to a woman (no spoilers) and she finds out that he has given one to another woman as well which also causes a problem. There are also some satisfying parallels with the old 1939 film The Wizard of Oz, such as the yellow brick road and the munchkins. The only problem with the story was the lack of some character development. The witches played by Kunis, Williams, and Weisz obviously harbored some negative feelings dealing with past circumstances towards each other that were not very clarified. The tension without full knowledge of the witches’ stories made the sympathy/enmity factor towards them not so evident, which seemed to be fairly important to the story. Nevertheless, the script and plot was well written for the most part and contained a lot of sentiment. Surprisingly the director of this film is none other than Sam Raimi, director of the Spiderman trilogy and Evil Dead. The last film Sam Raimi did was 2009’s uncharacteristically awful and cheesy, Drag Me to Hell. The movie was just horrible in which the plot was sporadic, the ending was unhappy and the acting was undignified. Oz the Great and Powerful, to say the least, is a fantastic redemption for Sam Raimi considering the saying goes “you’re only as good as your last film”. Something else worth mentioning is the fact that Raimi usually sticks with horror or mature-audience-directed films. Oz is an unexpected family film from Raimi done right with a perfect combo of friendly virtue and startling drama as well as fear. The comedic relief done by Kinley the monkey (Zach Braff), China Girl (Joey King) and a munchkin named Knuck (Tony Cox) kept the story upbeat as well. The most noteworthy acting in the film was without a doubt by Michelle Williams and James Franco. Williams kept her character bubbly yet serious and wise. Franco has a nice character arc, going from a small and negatively cunning guy to an admirable and clever man. Unfortunately the only characters a problem was found in were the witches portrayed by Mila Kunis and Rachel Weisz. Throughout the story they are both seen performing evil shenanigans and being manipulative, however their calamitous persona is not very well executed. Rachel Weisz, the wicked witch, was not as nearly as wicked and vain as she could have been and Mila Kunis seemed to just yell her lines rather than really project the underlying antagonized emotions her character, Theodora, possessed but it is in the end, a family film so you can only expect so much scariness. The direction and acting as a whole was for the most part quite exceptional. Despite some character development issues and slightly amiss portrayal of a couple roles, Oz the Great and Powerful was a thrilling, effervescent, old-time fairytale that will wow the general audience and although it may be somewhat conventional on the scale of all movies it’s sure to be a crowd pleaser and definitely worth a watch.